The United States has over six million commercial buildings – more than half are over 50 years old. These building are especially costly to operate, expensive to maintain and often uncomfortable to occupy. With Property Assessed Clean Energy (PACE), an innovative energy efficiency financing mechanism, renovating these buildings represents an economic development opportunity requiring zero taxpayer funding! A ribbon cutting ceremony hosted by the Saginaw County Chamber of Commerce and Saginaw Future Inc. highlighted the benefits of renovating this type of building. 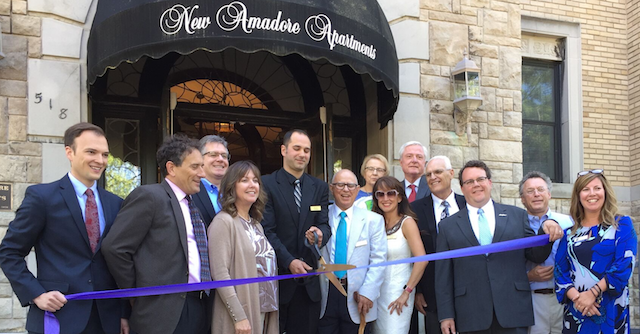 The recently upgraded New Amadore Apartments was The Energy Alliance Group of Michigan’s latest energy efficiency project using this funding option. Originally constructed in the 1920’s, the renovation of the historical building is expected to save more than $600,000 in utility and maintenance costs over the 20 year life of the financing. 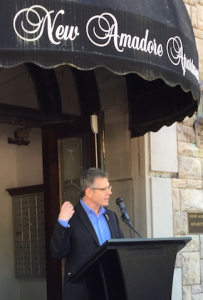 While that statistic is impressive, the economic development opportunities of renovations was the focus of the gathered dignitaries speaking at the ribbon cutting ceremony. The apartment complex is Saginaw county’s first property to take advantage of PACE. The County joined the Lean & Green Michigan statewide PACE program in September 2013 through a vote by the Saginaw County Board of Commissioners. Andy Levin, president of Lean & Green Michigan, provided the opening comments at the ribbon cutting event and also introduced the dignitaries. In his opening remarks, Levin noted how PACE financing makes it easier for owners of commercial, industrial, multi-family and non-profit properties reduce wasted energy, upgrade to energy efficient technologies and convert to renewable sources of energy. Levin described how PACE encourages private lenders to provide the capital that solves energy inefficiency problems in older, energy-wasting buildings. The local government, in this case Saginaw county, secures the private financing by facilitating a property tax special assessment on the building. No taxpayer funds are used – it is a private arrangement between the property owner, the lender and the contractor. “It’s a great American story about using the market to fix problems!” stated Levin. 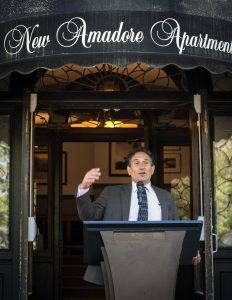 Kyle Peczynski of Petros PACE finance, noted the New Amador Apartment project was a win for the building’s owner as well as the tenants and the community. Petros financed the upgrade to the property owned by Maroo Nahikian. The financing paid for the replacement of 353 original single pane windows installed when the building was first constructed in 1929. Nahikian was not only able to secure the much needed capital to replace the outdated and inefficient windows, but because of PACE, he did so without incurring any out of pocket costs. A growing interest in the economic development potential building renovations represent resulted in EAG’s CEO, Scott Ringle, invited to present the details of PACE to the Economic Development Committee of the Great Lakes Bay Region. The committee includes representatives from eight counties in the thumb region of Michigan. As access to Property Assessed Clean Energy increases across the country, the economic development potential of renovating outdated buildings is financially viable. With PACE, the energy savings and the reduction in annual maintenance cost results in annual savings in excess of the required assessment – it actually costs a building owner to doing nothing than reduce the cumulative waste associated with older technologies. Great job…If nearly $600,000 was invested in the replacement windows, it was a solid investment, but if you had used our solar windows the owner would have accumulated a $180,000 Federal Tax Credit and experienced huge cuts in air conditioning usage over the next decades…at least 20% according to the National Science Foundation. With our transparent windows compared to clear glass, in the bright sun the color fabrics/objects have a 30 degree higher temperature readings with clear glass than with our transparent. We are looking at an office building in Detroit, 4 story for our windows and a 41 story in Chicago for our curtain wall which would be a $60MM + project. I am surprised only $300MM has been invested so far under the PACE Program… It should be many Billions by now.